Ethiopian Welo Opal (Ovl), Russian Diopside Earrings (with Push Back) in 14K Gold Overlay Sterling Silver 3.250 Ct.
Diamond (Rnd) Earrings (with Push Back) in Platinum Overlay Sterling Silver 2.000 Ct, Silver wt 5.87 Gms, Number of Diamonds - 208. Sri Lankan Moonstone and Tanzanite Earrings (with Push Back) in Platinum Overlay Sterling Silver 42.000 Ct.
Larimar (Ovl), Kanchanaburi Blue Sapphire Earrings (with Push Back) in 14K Gold Overlay Sterling Silver 20.000 Ct. Silver wt 7.41 Gms. 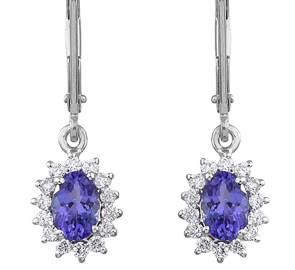 Earrings have been one of the most desired items in the history of jewellery and ever since the ancient Greek era, they have taken a variety of forms. Drop Earrings is one of the most preferred styles in the modern times and TJC brings for the style conscious women in the UK a plethora of designs at the most affordable prices. Flaunting precious and semi-precious gemstones like Tanzanite, Diamond, Ruby, Sapphire, Emerald, Amethyst, Quartz, Turquoise, Opal, Moonstone, Pearls, and Lapis Lazuli, our drop earrings are versatile pieces effortlessly accentuating your day and evening ensembles. Grace your earlobes with exceptional pieces of jewellery on an everyday basis, pick eclectic pieces from our in-house brands J Francis and Elanza flaunting simulated gems and Swarovski crystals in Sterling Silver. For special occasions, go for luxury pieces from the brand Iliana featuring big five gemstones, elegantly done in 9K Yellow & White Gold. TJC has also put together some special and artistic collection of drop earrings as your daily jewellery fixes like the Royal and Princess Bali collection, Tuscon and Tribal collection of India, Bird and Origami collection, Roman numbers and Honeycomb-inspired collection. Take your accessories to the next level with TJC’s immaculate collection of drop earrings from the house of designers like Stefy, Guisseppe Perez, Rachel Galley and Lucy Q. Pair them with matching pendant for an effortless yet coordinated look. Add a splash of colour to your wardrobe, with black, green, blue, pink and red drop earrings in the style of your choice – ball, tear, pear, long and small. Earrings also make for an appropriate gift for a loved one; delight your mother, sister, best friend or your wife with an enticing pair from TJC today, perhaps pick the ones with their birthstone for a more personalized touch. Look your best always with a beautiful piece of jewellery from the online boutique of TJC at incredible prices.